Promoting QuikTip within the hosting community is an important aspect in making the app successful. 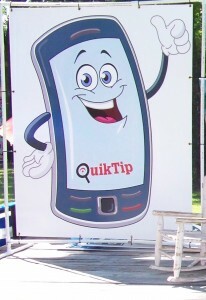 In an effort to promote QuikTip within their community, White County Invested in Substance Abuse Eradication (WISE Coalition) sponsored a float in both the Pangburn, AR and Higginson, AR Independence Day parades. WISE shared QuikTip with all of the attendees by handing out over 2,000 bookmarks to children during the Pangburn parade alone. They also passed out half page fliers to the adults. The highlight of the WISE float was the 6 foot QuikTip Cell Phone Guy (seen on the right). Because of the impressive turnout at the Independence Day events, WISE was proud to announce the receipt of several new tips and an increase in app downloads. This entry was posted in Uncategorized on July 25, 2014 by quik-admin-woohoo.